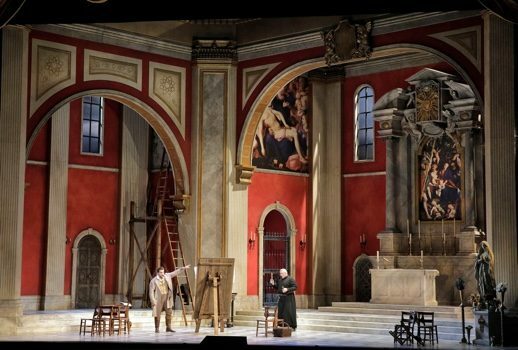 Excitement permeated in the air at the War Memorial Opera House on Wednesday night for the opening performance of Puccini’s perennial favorite Tosca. No, it wasn’t either for the fact that merely four years passed since the last revival (in Thierry Bosquet’s trusted old sets), or for the new (quite conventional) production by director Shawna Lucey and production designer Robert Innes Hopkins. As a special friend of the fine jewelry house Bulgari and Milanese couture designer Antonio Riva, Giannattasio melds artistry and glamour. She has been affectionately called the “Lady Gaga of opera” by Plácido Domingo for her bold and evolving artistry and style. Giannattasio herself seemed to fully embrace her diva status. Among the well-dressed people during the SF Opera Opening Night Gala last month, she chose to present herself in this amazing head-turning getup. The question remained, did she deliver at the opening performance? Personally, I would say the answer was largely yes, with some reservations. I think she excelled in Act 1 and 3. Below I would break down the performance act by act in greater detail. Act 1 went pretty smoothly, although I had a big problem with the set. The Church of Sant’Andrea della Valle was depicted with Cavaradossi’s scaffold on the left, and the Church altar was in the back under the giant arch to the right, with the Attavanti chapel right next to it. However, the altar (and the arch) was deeply angled towards the house left, so even from my seat at the house right aisle, I could barely see it. A lot of action happened in front of that altar, especially during the Te Deum scene, so I couldn’t even imagine the sightline for those sitting farther right than me. A set that ignores almost a quarter of the audience is disrespectful, in my humble opinion. Tenor Brian Jagde, veteran from the last two revivals here (2012 and 2014), came very close to being the hero for the night. His voice has darkened considerably since the last time I saw him, but he gained more depth and understanding in his interpretation. His Cavaradossi was a happy and carefree man, almost childlike, totally oblivious of the tragic turn of events. This was particularly evident in the banter during the opening scene with Dale Travis’ Sacristan, played for laughs. “Recondita armonia” Jagde sang expressively without being overindulgent, which Jagde had tended to do previouly. From the “Mario! Mario” call, it was obvious that Giannattasio’s Tosca was a full-fledged woman; confident and yes, in love. 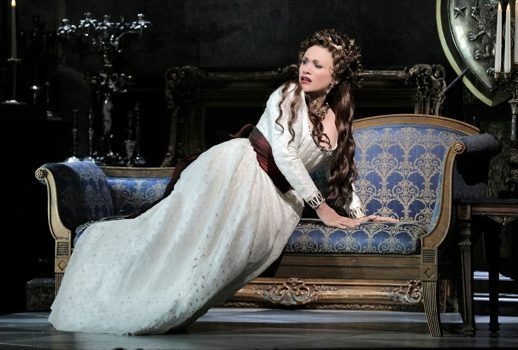 Giannattasio has a dark soprano voice that was an asset for a role like Tosca. She and Jagde were believable as lovers, in fact, they developed great rapport and their voices blended harmoniously. Sparks flew on stage when they were together. 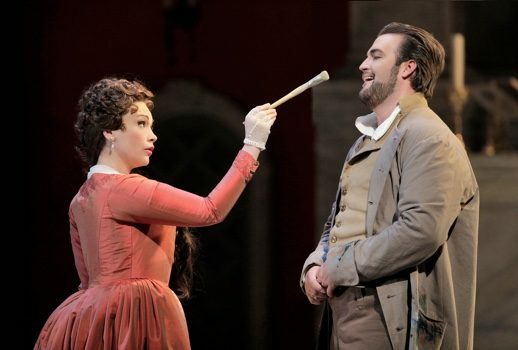 Giannattasio’s Tosca was also playful the whole first act. It wasn’t until “Dio mio perdona. Egli vede ch’io piango!” that I started to feel she was capable of feeling distressed as well. I was less pleased with Scott Hendricks’ Scarpia, which I felt didn’t have sufficient gravitas to serve the evil personification. The duet with Tosca in this Act was completely devoid of menace and ill-intention, and he might as well have disappeared during the Te Deum scene. It wasn’t a good omen heading into the Act 2 confrontation. Hadleigh Adams was a forgettable Angelotti. Unfortunately, Act 2 was a dreary affair. All the troubling signs from Act 1 manifested fully after the intermission. At least the set for this Act was an improvement. Up center was the torture room for Cavaradossi (silhouettes of Cavaradossi’s being tortured were reflected on that white windows), but that created a problem; Tosca spent a lot of time singing to those windows, muffling her voice. 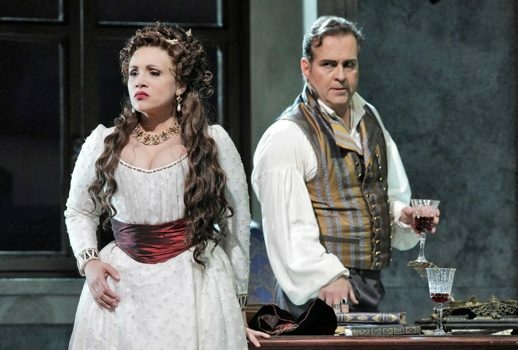 t also didn’t help that she was in a plain white dress far removed from the usual luxurious gowns we expect from Tosca. Frankly, it was something of shock how little glamour she projected. Even the famous “Vissi d’arte” son only polite applause at the end. Joel Sorensen expertly portrayed a slimy Spoletta and Andrew Manea, fresh from being Nottingham in Roberto Devereux, created a dignified Sciarrone, more menacing than Scarpia himself. Then, disturbingly, the children simulated the execution with their brooms, with one of them pretending to be the fallen victim. Confusingly, the shepherd boy’s song “Io de’ sospiri” was sung from somewhere in the auditorium. But it got better. Christian Pursell, another Adler Fellow, made a very effective Jailer, and Jagde brought the house down with his rendition of “E lucevan le stelle,” marked by pianissimi that I didn’t know he had it in him! It was impressive, and obviously, greeted with loud cheers and bravos. The duet that followed with Tosca (“O dolci mani”) was naively, joyful as if they really believed there would be happy ending to their plight, and the concluding scene was perfectly acted and timed. Conductor Leo Hussain, who also made house debut last night, led the Orchestra with some clarity albeit ponderous tempos; the sound, though, was too blunt to sound genuinely Italianate.